This month’s Data Dump Podcast spotlight’s a different kind of data buyer - a buyer of data companies. 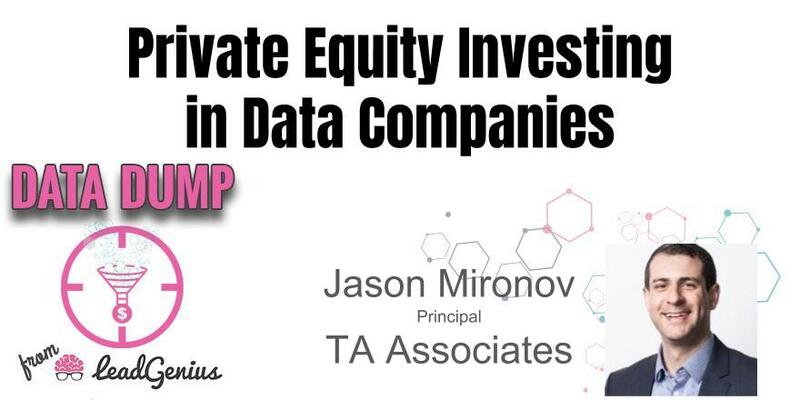 Mark Godley, Data Dump Host & CEO of LeadGenius, chats with Jason Mironov, Principal TA Associates, about the role that private equity investments play in the data world. Jason eloquently explains how private equity and VC funding companies differ in focus and how TA Associates helps companies maintain self-sufficiency, grow profits strategically and how best to set up companies for success. Tune in to get a different look at the B2B data world as well as some future predictions that just might help your investments. Jason joined TA in 2012 and has more than 11 years experience in private equity and financial services. His current investments span information services, integrated payments, consumer and travel. With domain experience across industries, Jason looks to partner with management teams and founders with a customized approach and a clear strategy for growth and transformation.